It’s early. You can feel the sun shining on your tent and the temperature is starting to rise. It’s only a matter of time before you’ll need to roll out of bed and find a cool spot to relax and start your day. There’s one thing that you know you’ll need pretty quick, and that’s something to quench your thirst. At a festival, you need to take care of yourself by keeping your body and mind refreshed at all times. One of the best ways to do that is through liquid delights. Let’s take a journey through one of the magical days we’ll be experiencing at Lucidity, and all of the beverages we can enjoy along the way. The best way to start off the day is with a big drink of water. My favorite way to take care of my future self is by filling up my water bottle on the way to my tent at the end of the night. There’s nothing better than waking up parched and being able to instantly quench your thirst. And this is just the beginning of our hydrating journey. After you get your fill of water, there are plenty of choices for morning pick-me-ups. I’ve seen everything from pre-made juices to cold-brew coffee. If you have the luxury of bringing a propane stove, your options just grew exponentially. For tea drinkers, I recommend yerba mate or green tea bags. For coffee connoisseurs, you could treat yourself and bring all of the makings for a delicious pot of fresh pressed beans. The morning mug is your oyster! 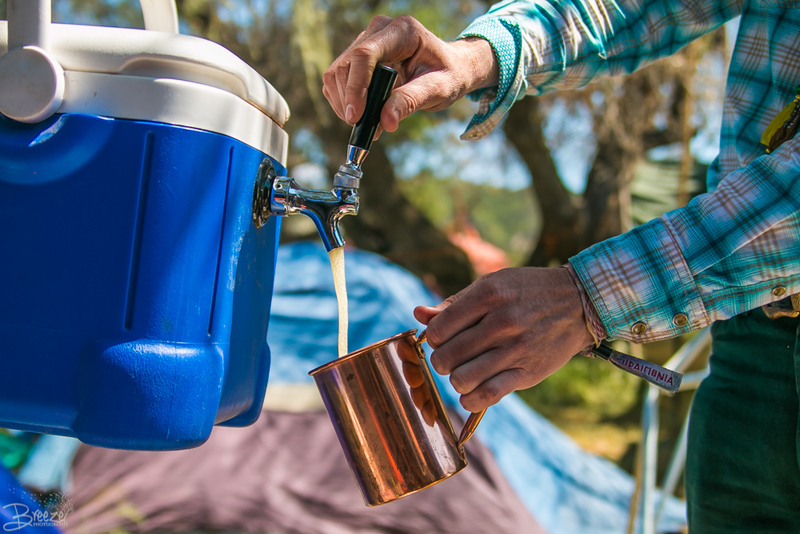 Before leaving camp for a daytime adventure, don’t forget to drink water, and pack some hydration supplies. A few of my favorites include pineapple ginger kombucha or coconut water. If you’re feeling ready to start the party, you may pack a can of beer or a canteen with some wine. This could also be an excellent time for a mimosa, just sayin’. Don’t forget to pack all of the things you need to carry your drinks around the festival and keep them warm or cool. Lucidity vendors offer a variety of tasty thirst-quenchers, too. In the past, I’ve seen everything from green juices and kombucha to local craft beers and other fizzy-lifting drinks. Hot or cold, alcohol or virgin, you’re sure to find something you like. 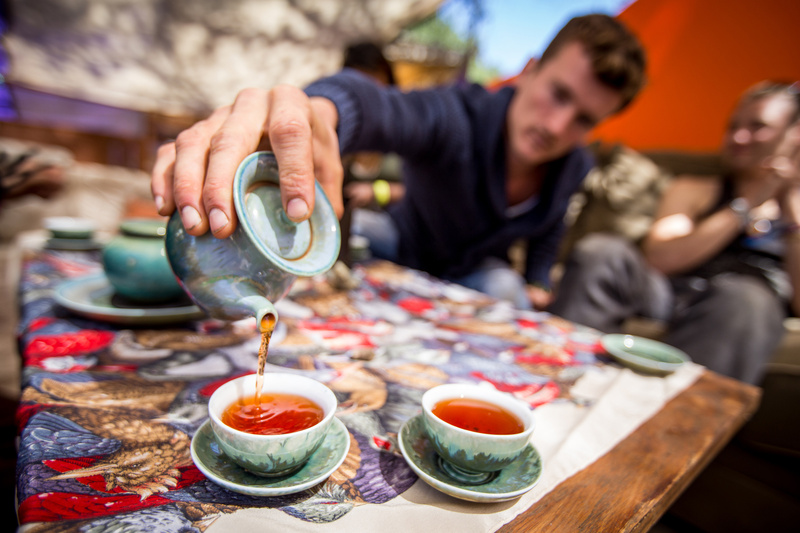 No matter where you wander at Lucidity, you’re never too far from a teahouse! Stumble off the dance floor and into a cozy spot to sit. Enjoy a warm cup of tea or refreshing herbal soda at Lucidi-TEA (Tradition – Ethics – Activism) when you find yourself in the Spirit Realm (take a peek at the superbly delicious drink menu from The NOHM that you’ll find in Lucidi-TEA). 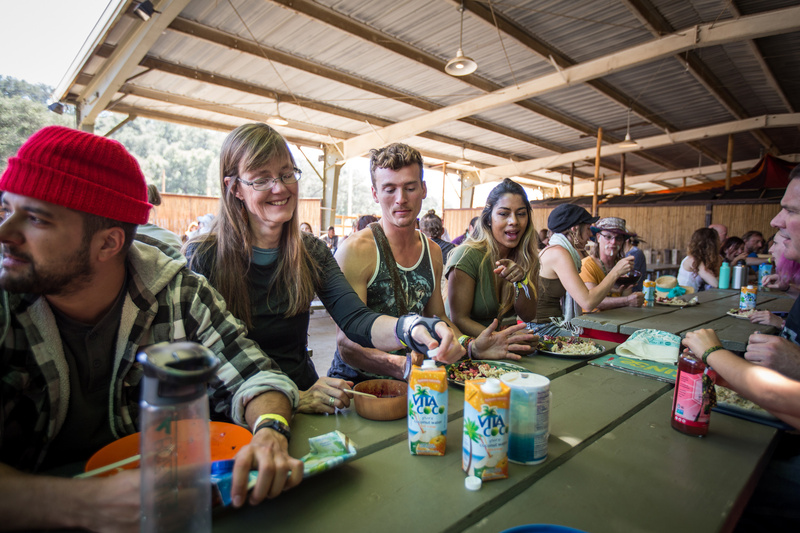 After returning back to camp from your daytime adventures, guess what time it is? Water-drinking time! Walking and dancing around a festival all day means you need to drink more water than you normally would at home. One easy way to remember to drink is to fill up your water bottle every time you see a water station and drink the contents of your bottle every time you switch activities. 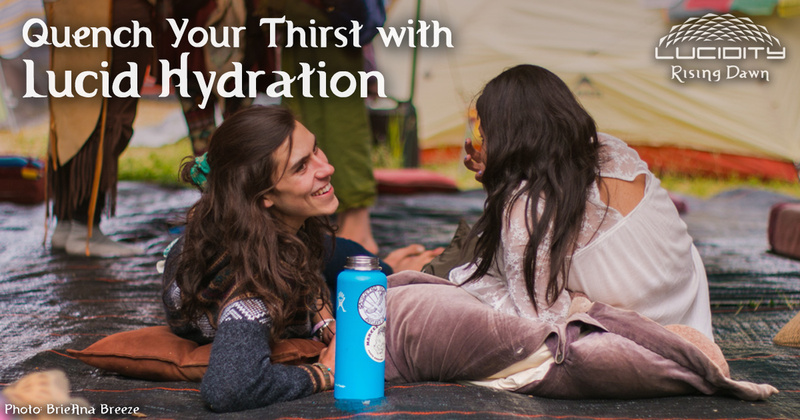 There’s so much to do at Lucidity that you’re almost guaranteed to stay hydrated this way. As the day turns to night, there are a few drinks that might help you along the way. Caffeine can be your friend when you want to stay up late dancing. Kombucha is typically made from black or green tea and has a nice caffeine kick. Not a fan of fermentation? My camp often brings energy drinks like Red Bull for quick pick-me-ups. If you’re looking to bring a delicious drink to share, try this caffeinated twist on sangria. It’s alcohol free and you can make a big batch to offer to your crew and all the new friends you meet along the way. Getting tired of your normal water breaks? Bring some sparkling water (La Croix, perhaps?) to mix it up and continue to stay hydrated. It doubles as a great mixer! Coconut water is also a nice way to hydrate with a little more flavor. And, it works as a great mixer with rum! Last but not least, don’t forget to leave your glass containers at home. Lucidity doesn’t allow glass bottles anywhere on the festival grounds, so buy your drinks a few days early and transfer liquid from glass containers into reusable containers. It’s a great way to reuse any plastic containers you were about to recycle. Easy fix! 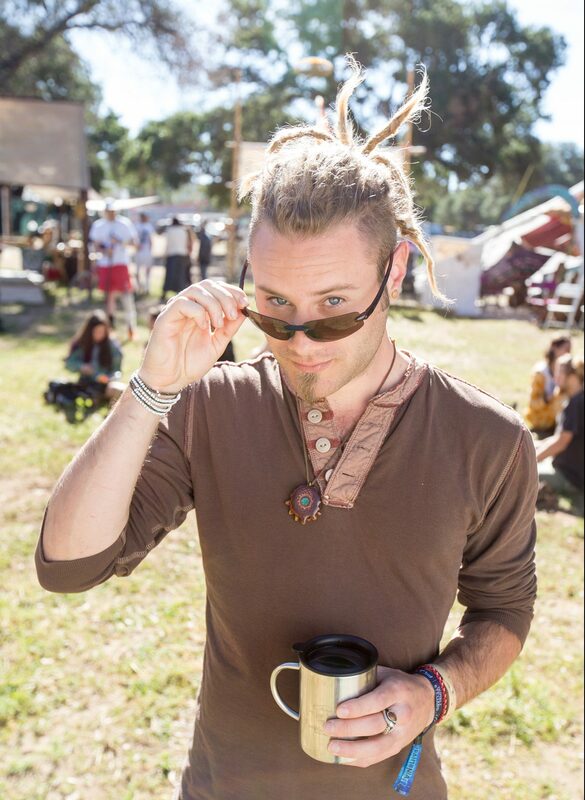 If you see me at Lucidity this year, come say hi so we can cheers to an amazing experience (and drink some water) together!